Bandai Networks has announced that as of today it will offer a custom mobile service based on their popular Gundam character through KDDI’s ‘Au one avatar’ platform. Members will be able to create and update their own unique avatar from an initial choice of three characters; “Mobile soldier Gundam”, “Gundam SEED DESTINY”, and “Fmofmo” which can then also be used across several of the carriers other Au one portal destinations. Each original character can be made by combining various items like the face, the hairstyle, and clothes, etc. by using the EZ application program. 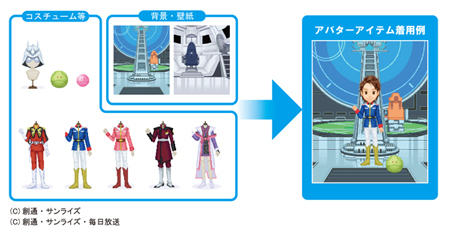 Avatars can then participate in the fashion contest, and be used as the template for mobile ‘deco-mail’. The unique avatar can also be displayed as users appearance on coordinated sites such as “Au one blog” and “au one My Page”. In addition, it’s possible to configure and use the service from regular PC if the client is registered on “au one” portal site. The costume and the background wallpaper include about ten item choices and the membership fee ranges from $3 – $4 per month. More details [in Japanese] Here.